Even though I liked my cards from Seehere, I wanted a card not a postcard. I didn't like the flimsy paper and prefer a heavier cardstock. The above cards are what I made from my photos. Taking the photos took a couple of different efforts and it was not easy but I'm happy with the outcome. I created these from my Zazzle account. 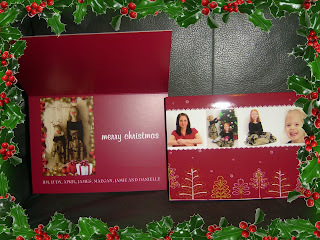 After making my ornaments from CafePress today, I need to explore card making there too! 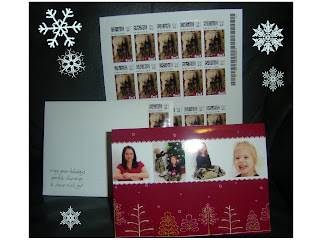 I also bought matching stamps but used Picnik.com to turn the girls into reindeers and I added a fun border. I should get paid for Picnik as I am always praising them! I used my Stampin' Up stamp to add the little Christmas saying on the side and Christmas tree stickers from Target to seal the back. Now I have to address all of them and determine if we will send a stack to my husband's soldiers as that will be a task!